I’d like to take a moment to be grateful for modern day inventions like the washing machine. In the old days, Laundry Day was a grueling chore of hand and washboard scrubbing. Now we just sit on our butts and let the machines do most of the work. I guess it’s just a natural evolutionary progress that someone made a washing machine that we can actually sit on. 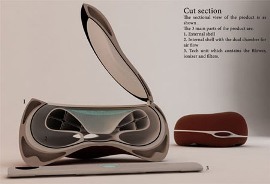 This concept device of washing machine/cozy chair is designed by Harsha Vardhan. Since no water is required to run this device, you don’t have to devote a “laundry room” to this washing machine seat. You heard me right the first time, no water is required, and the same goes for detergent. The inner chamber works like a pressure washer and uses ionized air, which also means that you won’t have to have a matching seat for a dryer. The whole thing can open up, and the clothes get thrown in. The controls are some kind of slide-out mechanism. I can only assume that the interface is some sort of digital job, and that the user won’t have to fiddle with any dials or big buttons. This device is a must for any bachelor. Just pick up all the dirty clothes off the floor, put them in the seat, and relax as you wash.